IQ Health’s Accredicheck service provides a link between hospitals and their external corporate or business visitors - such as visiting doctors, agency nurses, medical company representatives, allied health professionals, medical students and tradespeople. The IQ Health’s Accredicheck service collates visitor information on the above requirements so that hospitals can quickly assess visitors’ eligibility to access the hospital. IQ Health is currently working with Australian hospitals to determine their tailored accreditation requirements. Once these requirements are coded into Accredicheck, you will be able to quickly assess your accreditation status for different hospitals, and rectify any deficiencies before attempting to gain access to the hospital. By registering with Accredicheck and providing your accreditation information now, you will be one step closer to gaining Accreditation and immediate access to hospitals as and when they implement Accreditation checking requirements. Please contact us to find out more, or to register with Accredicheck. 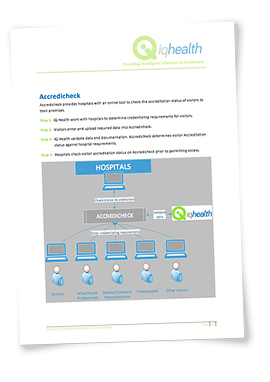 Accredicheck is a free online service provided to hospitals to quickly check the Accreditation status of visitors registered with Accredicheck, against internal hospital policy requirements. In addition, Accredicheck will provide hospitals with a real-time log of registered Accredicheck visitors on hospital premises, as well as historical reports on visitors and their accreditation status. Please contact us if you would like to arrange free access to Accredicheck. Prior to set up, we will work with you to code your internal accreditation policies into Accredicheck. IQ Health is currently working with Australian hospitals to determine their tailored accreditation requirements. Once these requirements are coded into Accredicheck, you will be able to quickly assess your employees’ accreditation status for different hospitals, and rectify any deficiencies before they attempt to gain access to the hospital. By registering with Accredicheck and providing your employees’ accreditation information now, your employees will be one step closer to gaining Accreditation and immediate access to hospitals as and when hospitals implement Accreditation checking requirements. Download our Accredicheck brochure now!